I appreciate a good wreath any time of the year! This one below is adorable for the entire fall season, and doesn't cover our peephole, which is definitely a plus! We don't have a mantle, but I enjoy decorating our entryway table. 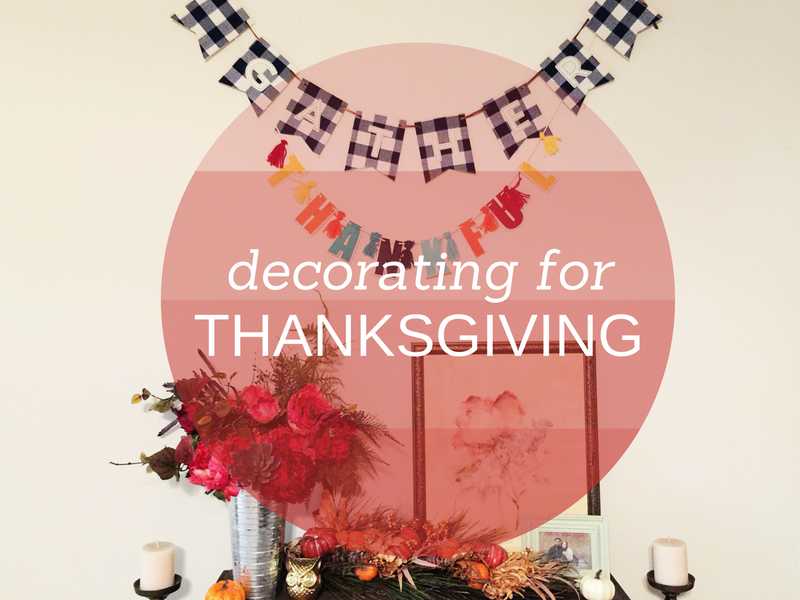 For those of you with a mantle, these decorations can work for those or an entryway table. Of course, it's all preference! In this transition, I replaced the pumpkins with a harvest-themed door swag! I left a few small pumpkins on the table, but used the swag as the focus. I also hung a couple of layered banners to add some flair to the wall. Why, yes. We did add another bookshelf since the decorating with pumpkins post. Thanks for noticing! Here, I added some gourds above the shelf and within the shelving to fill space! I love filling the empty space above our cabinets. I use it as extra storage space, but it's also a great place to subtly add decor, as well. It was as simple here as place a pumpkin above the cabinet. Use practical items to decorate, too, including salt and pepper shakers, dish towels, and potholders. Do you decorate for Thanksgiving, or do you skip straight from Halloween to Christmas? What tricks and tips do you have for holiday decorating? Yes! I mean, granted, I love the woodsy look year round, but it's such an easy fall/harvest look! And yay for Christmas!